Remembering a Former President | Kid Reporters' Notebook | Scholastic Inc. The George H.W. Bush Presidential Library and Museum is located in College Station, Texas. In early December, Americans paid tribute to former United States President George Herbert Walker Bush, who died on November 30 at the age of 94. Bush served as president from 1989 until 1993. He was also the father of former President George W. Bush, who served from 2001 until 2009. The elder Bush was born on June 12, 1924, in Milton, Massachusetts. On his eighteenth birthday, with World War II raging, Bush enlisted in the United States Navy. He would become the youngest pilot in Naval history and a decorated war hero. During the war, Bush flew torpedo bombers. After his plane was shot down by Japanese fire on a bombing mission over the Pacific Ocean, he earned the Distinguished Flying Cross for his heroism. In 1945, Bush married Barbara Pierce, who remained by his side until her death on April 17, 2018. The two set out for Texas in 1948, after Bush graduated from Yale University and got a job in the oil industry. Bush would go on to start several oil and petroleum companies before turning to politics and a life of public service. In 1966, after an unsuccessful run for the U.S. Senate, he was elected to the House of Representatives. He later served as U.S. Ambassador to the United Nations, chairman of the Republican National Committee, and director of the Central Intelligence Agency (CIA), among other roles. From 1980 to 1988, Bush served as Vice President to President Ronald Reagan. After Reagan’s two terms in office, Bush ran for the presidency and won. The George H.W. 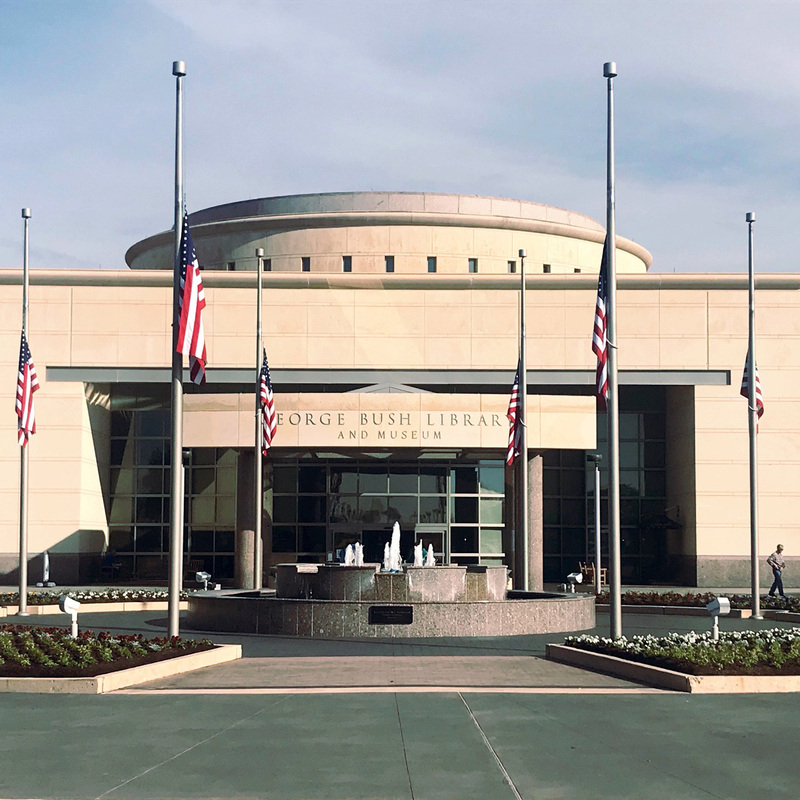 Bush Presidential Library and Museum in College Station, Texas, tells the story of the former president’s life. During a recent visit, I spoke with museum volunteer Doug Pollak. He said that Bush’s leadership at the end of the Cold War was a highlight of his presidency. “When the Berlin Wall came down, Bush met with world leaders to make sure that communism ended peacefully,” Pollak said. During his presidency, Bush also signed the Clean Air Act and the Americans with Disabilities Act into law, and initiated the Gulf War to expel Iraqi forces from neighboring Kuwait. In 1990, Bush founded Points of Light, a nonprofit organization that promotes volunteer service worldwide. The President also created the Daily Point of Light Award to honor individuals who are making a positive difference. To date, more than 6,000 people have received the award. Although Bush lost his bid for reelection to Bill Clinton in 1992, he did not retire from public service. In 2005, he worked with his successor to raise more than $100 million for Hurricane Katrina victims. In 2011, President Barack Obama awarded Bush the Presidential Medal of Freedom for his more than 70 years of public service. In his later years, Bush also fulfilled a promise to skydive on his 80th, 85th, and 90th birthdays. Bush died at his home in Houston, Texas, a little more than 7 months after the loss of his wife, Barbara. He is buried on the grounds of the presidential library and museum with his wife and their daughter Robin, who died of leukemia as a child.